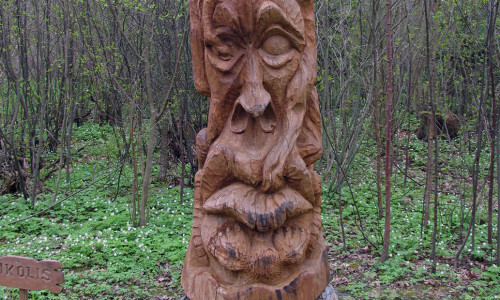 38 wooden sculptures. Let it be your first introduction to our ancient religion! 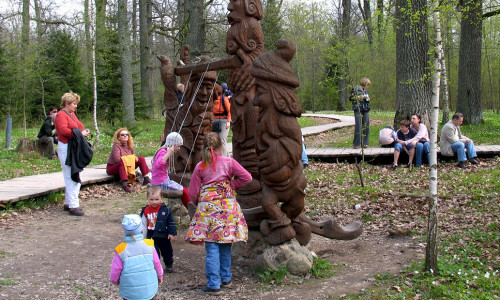 In this cognitive walkway, your companions will be 38 sculptures of Lithuanian gods, goddesses and other mythological creatures. The journey will take you to mythical times when the last European pagans, Lithuanians, used to worship their gods in sacred oak woods. It is said that ancient Lithuanian high priests, called kriviai krivaičiai, were able to hear the words of gods transmitted to them in the rustle of oak leaves. 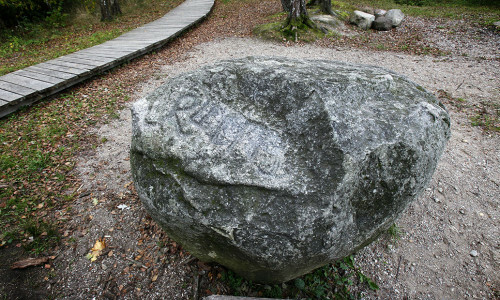 Airėnai stone with symbols. 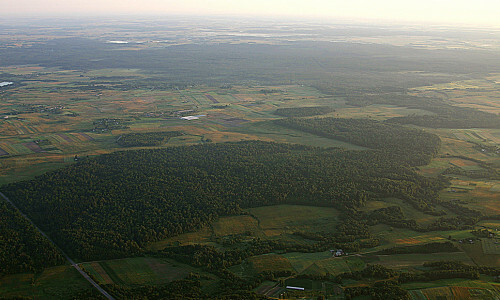 It’s one of the most interesting and yet unsolved secrets of our park. 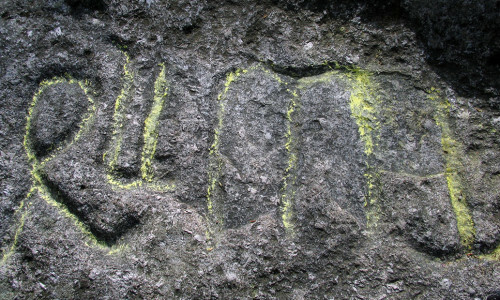 On its side, a cross and strange inscriptions that raise many discussions are carved. It is believed that money is buried under it, so many people have tried to dig on all sides of the boulder looking for the treasure. No one has ever succeeded, but people still trust in the stone’s magical powers. Believing that their dreams will come true, visitors leave coins, food or flowers on the boulder’s top. Or they raise their palms above the mysterious inscriptions – it is said that if you keep them like this for a while, you can feel an unusual warmth coming from the symbols. Orchids. 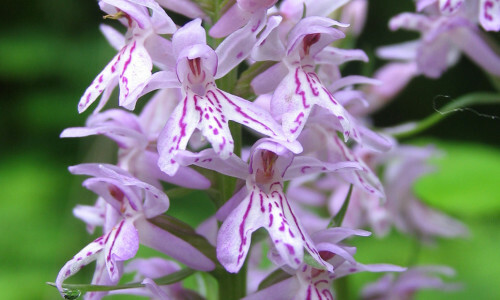 In July, purple spindly flowers – the common spotted orchids (Dactylorhiza fuchsia) – start blooming here. 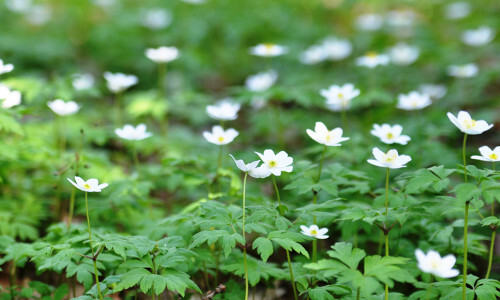 These beauties of Dūkštos oak wood are the only type of lithuanian orchids that vegetate not in swamps or wet meadows, but in shady forests. Besides the marvelous looks of their blossom, the common spotted orchids also fascinate us by their vegetative cycle – it takes 3 years for a germinated seed to raise its very first leaf, and up to 17 years to nurture its first blossom! 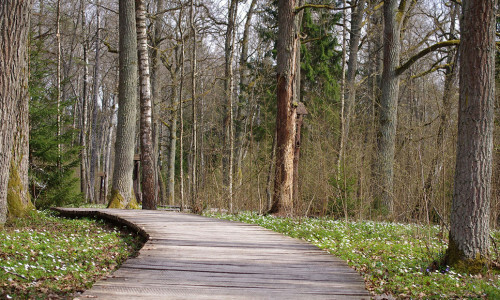 Wooden path. 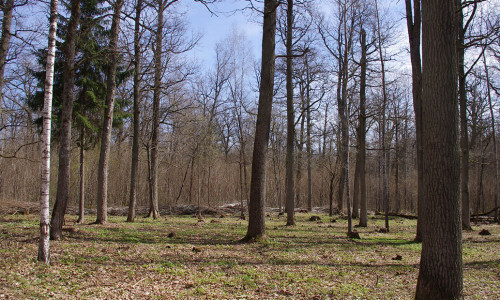 In fact, a walk in this oak wood is more like striding down the avenue than wandering along a narrow forest trail. The wide tangential walkway here has a full wooden board cover, so it won’t let you get lost in the wilderness or get your feet wet. 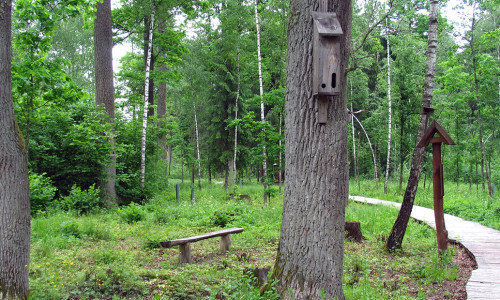 Because of the cover, families with small children, elderly visitors and disabled people can also admire this miraculous forest. 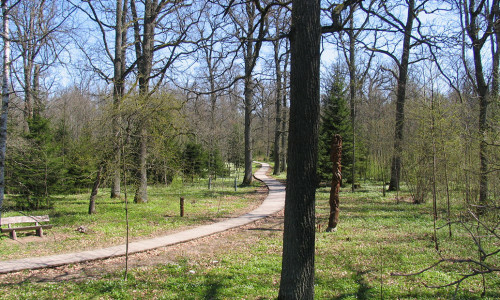 This trail is one of the most beautiful and the longest cognitive walkway in Lithuania adapted to disabled people.